Audio Analogue Puccini Anniversary review | What Hi-Fi? We have fond memories of the original Audio Analogue Puccini, particularly in upgraded SE form. It delivered a combination of warmth, fluidity and insight few rivals could match, and did so wrapped in a beautifully elegant case. Even the remote was special – a small, coffin-shaped metal unit equipped with just the minimum of buttons. All this loveliness would have set you back around £600 in the late 1990s, but since then, it’s fair to say Audio Analogue’s output has been uneven. 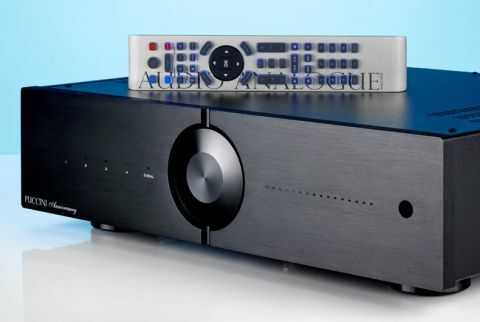 There have been some truly excellent high-end amplifiers – we remember the stunning, if ill-proportioned, £9000 Class A integrated with particular affection – but also some average performers that failed to spark our interest. The company is now making a determined effort to recapture some of that old magic, and the result is the new Puccini Anniversary amplifier. Though it shares a name with the classic original, one peek at the price tag is enough to conclude that it is competing in a very different part of the market. In many ways, this 20th Anniversary celebration is a return to the simple days, and none the worse for that. It’s an integrated amplifier with five line level inputs, one of which is balanced. There isn’t a phono stage, or built-in digital-to-analogue conversion circuitry either. We don’t necessarily think either omission is particularly damaging with a premium product of this type. While we can fully appreciate the neatness that comes with including both these modules in a single box, there is usually a price to be paid in overall performance. We haven’t come across many cases where a built-in phono or DAC can’t be bettered by even relatively modestly priced outboard units. Not only that, but building such circuits into an integrated amplifier tends to divert the designer’s attention (and budget) away from the basic design and has a habit of limiting sound quality due to their innate noise and power demands. The Puccini’s build quality is as good as we’ve come to expect from Audio Analogue. There’s something of a handcrafted feel about this product, in the sense that it’s solid, smartly finished and aesthetically understated. The Anniversary is a hefty unit too, weighing in at 18kg. Make sure you have a solid support and plenty of ventilation. Take a look inside and you’ll find neatly made circuit boards and a dual-mono circuit layout where the left and right channel signal paths mirror each other. This goes all the way to the connections on the back panel, which are split with left and right connections bunched separately. The advantage of such a design should be more stable stereo imaging and better performance through reduced interaction between the channels. The mains transformer is rated at a relatively hefty 700VA, and helps the amplifier deliver 80W into an 8ohms load. That figure may not be overly impressive, but consider that the Anniversary’s power output goes up to 300W per channel as the load’s impedance drops to 2ohms and everything looks a lot healthier. This means this amplifier will cope with difficult speakers well, and shouldn’t be so fussy about partnering either. The circuitry is also unusual in that it avoids the use of global feedback. Feedback is used in electrical design to reduce distortion, and almost every amplifier uses this technique in one way or another. But some designers feel that it degrades the sound to a certain extent, and so try to use less of it. Few go even further and try to get rid of it altogether, and that’s the case here. This type of approach is something more often seen on valve amplifiers, and Audio Analogue feels that it helps the Puccini to deliver a clearer, more realistic sound. It’s not easy to balance the various stages of the circuit to produce a stable design without some form of overall feedback, which is why we don’t tend to see too many products following this philosophy. In use this is a straightforward product, so there’s little here to confuse. On a practical note we’d like the volume control to be easier to hold – at the moment its shallow dome shape looks nice but leaves little room to get a purchase. Also, the indicators for the input and volume settings are hard to see from an angle regardless of the brightness setting chosen. Apart from that it’s all plain sailing. We used our trusty Naim NDS/555PS streamer as the main source with back up provided by Clearaudio’s Innovation Wood turntable coupled to a Cyrus Signature Phono stage. Speakers used included ATC’s SCM50s and PMC’s Twenty 23s. Start listening to the Puccini and there’s much to admire. It’s a refined amplifier, in the mould of the original, though with considerably more muscle and insight – just as it should be considering the premium price. It’s right at home with Mount The Air by The Unthanks. The presentation is pleasingly full-bodied with punchy yet still articulate lows providing a firm foundation for the midrange to shine. It’s here, with voices, that the Puccini plays its strongest card, delivering an insightful and articulate performance that’s as good as anything we’ve heard at this price. There’s natural warmth and a charming organic quality to small-scale dynamic shifts that has us spellbound. Moving onto Tchaikovsky’s 1812 Overture shows a lovely mix of delicacy and dynamite. We’re pleased by the Audio Analogue’s level of organisation. It sounds wholly in control and is as composed as you like when the production becomes demanding. The cannon blasts – real cannon fire in the case of this recording – come through with the requisite force and a crisp initial crack. There’s proper authority here, belying the relatively modest claimed power output. Stereo imaging is lovely too. It’s crisp, stable and nicely layered with an expansive sound stage that fills the speaker end of our listening room with ease. Radiohead’s In Rainbows shows up some slight weaknesses in the Anniversary. That smooth character may help to tame aggressive recordings, but here we find ourselves wanting more exuberance from the product. It plays things slightly safe for our tastes, never quite giving percussive stabs enough energy or delivering the album’s complex rhythm tracks with the full amount of snap they deserve. The Puccini remains a capable and entertaining choice, but similarly priced rivals such as Naim’s Supernait 2 manage to dig up more in terms of excitement and rhythmic dexterity. In short, the Naim is a bit more fun. Make no mistake, the Puccini Anniversary is a fine amplifier, and its sophisticated approach to music replay works a treat. Add fine build and ease of use into the equation, and it’s easy to see the appeal of this amplifier. While not quite delivering the all-round magic of the original Puccini, this Anniversary model still does enough to make its ancestor proud.